This comedic hour from CBeebies presenter, Andy Day and his equally daft pal, Mike is packed to the rafters with silliness. Merriment and mayhem that’s quite literally for all the family. Pleasance Courtyard, 556 6550, until 23 Aug, 12.50pm, £8 (£6). Another triumph for the Theatre of Widdershins, as they deliver a fun take on the popular tale. Featuring beautiful sets and puppets. Scottish Storytelling Centre, 556 9579, 7-30 Aug (not 17 & 24), 11am, £7.50 (£5). The team that brought you The Gruffalo have surpassed themselves with this lively adaptation of Julia Donaldson’s picture book. Highly recommended. Pleasance Courtyard, 556 6550, until 31 Aug (not 19 & 20), 2.30pm, £8.50–£9.80 (£7.50–£8.50). Bandy legged and uncoordinated, Gerald the giraffe was the outcast of the jungle – until he learned to dance to his own tune. 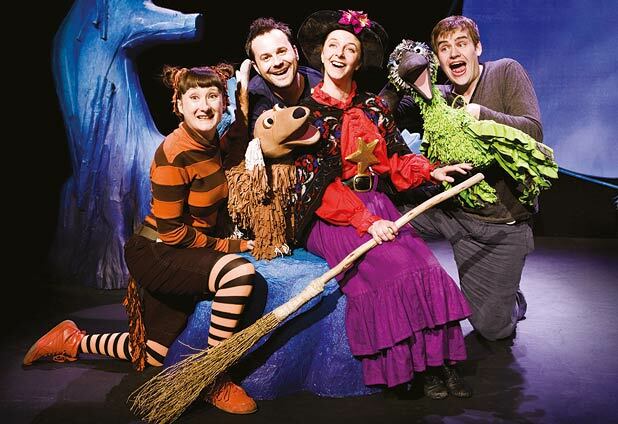 Imaginative storytelling and song, with large-scale puppets from Blunderbus Theatre Company. The Space @ Royal College of Surgeons, 0845 508 8515, until 29 Aug (not 16), 10.35am (9 & 23, 2.35pm), £7 (£6). An old fashioned yarn for modern audiences, as storytellers Danya Miller and Louise Coigley bring Janet and Allan Ahlberg’s tale to life. Scottish Storytelling Centre, 556 9579, until Aug 14, 1pm; then at Valvona & Crolla, 556 7800, Aug 15 & 21-22, 10.30am, Aug 16-20, 1pm, £7.50 (£5). Songs, laughs and scary fun for children with stories of witches, cats, dogs, birds and frogs. Ages 3+. A mysterious, magical box appears, but to open it, CBeebies presenter Andy Day and comedy partner Michael James must take the journey of their life! Come and find out what's inside! Gerald the giraffe was not a good dancer. Every year, he dreaded the great Jungle Dance. But one beautifulmoonlit night, Gerald discoversthat sometimes all we need is a different song to dance to! Bad hair day? Pity Rapunzel: a mad witch climbing her locks every day. Ouch! Grimm tale returns to its dark roots. 'Very wonderful, beautiful puppets' - ***** (The List). 'Fantastic' - ***** (ThreeWeeks). Sell-out 2007/2008.